You will be picked by our guide from your hotel of residence at 0700am , then proceed to Bwindi Impenetrable Forest in South Western Uganda. A stop over at the Equator for an informative talk as well as some photo shooting opportunity and snacks. Then proceed to Igongo cultural centre or Mbarara town for your en-route lunch at Agip motel and then proceed through rural countryside of Uganda. En-route view of the beautiful scenery, terraced farming to Bwindi Impenetrable National Park home to half of the endangered mountain gorilla. Diner and overnight at Buhoma Lodge or Mahogany springs (High end), Engagi lodge/Silverback Lodge (Mid-range end), Buhoma Community Bandas (Low end). Meal plan: Half-Board. Today you will go through the same preparations the previous day ready for your second day of Gorilla tracking. This time, you will be allocated a different gorilla family to visit. Have a whole new experience with another gorilla family see the babies, mother Gorillas and the Silverback again and learn how they relate with each other. Diner and overnight at Buhoma Lodge or Mahogany springs (High end), Engagi lodge/Silverback Lodge (Mid-range end), Buhoma Community Bandas (Low end). Meal plan: Full-Board. Elephants, Antelopes and the Warthogs. A stop over at the Equator line in Kasese. Enjoy the winding scenery of the foot hills of Mt. Rwenzori arriving in Fort Portal for lunch thereafter continue to Kampala or Entebbe for your outgoing flight back home or to your next destination. Meal plan: Half-Board. End of the 4 Days Double Gorilla Trekking Safari in Uganda. 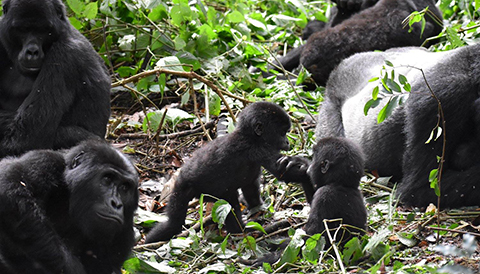 This 4 Days Double Gorilla Trekking Safari in Uganda package includes. The 4 Days Double Gorilla Trekking Safari in Uganda package excludes expenses of personal nature like: Air fare, Visa, drinks, laundry, tips to local guides, telephone, porter fee while trekking, personal insurance, personal shopping bills and cigars.